Callum Johnson Climbing: Snippets – Unfinished Stories and Anecdotes of Days Enjoyed. Snippets – Unfinished Stories and Anecdotes of Days Enjoyed. The well stepped trail across the crusty snow was welcomed; the light from the moon and stars was tranquil, lighting the way I hardly needed my headtorch. The long drive after work from Aberdeen to Fort William was almost worth it already, and I wasn’t even at the hut yet, I hadn’t even swung an axe, but the freedom, the release from the city, the escape from the work routine. The walk gave time to think and ponder as I followed the steps of others fuelled by the fresh cool air, glancing up occasionally at the stars and the moon lighting up the north face of Ben Nevis. I could see tantalising white streaks down the steep cliff faces, I was scanning the cliff, searching for the route I had in mind. I knew that Uisdean and Doug had climbed Gemini on Carn Deag Buttress earlier that day and were still up at the hut, tomorrows forecast looked good. Gemini takes a series of steep walls and grooves joined by some easier angled ramps all smeared with ice and shouting out to be climbed. One of the many classics on this section of the cliff it is full of character and exposure with great views across to Carn Mor Dearg to the north and Lochaber to the west. The morning of the 22nd of January, the hut is still quiet so I slept well and I’m up beat, in the coming weeks the hut fully booked until April –it will become quite a hubbub of activity. The sizeable bowl of porage with banana fuelled the day. It was good to climb Gemini early season and before the UKC masses caught wind of the conditions, it seemed to become a bit of a trade route in the weeks that followed. The forecast for Friday was warm and windy so I raced back to Aberdeen and worked the Friday to save a precious days holiday for another day, my only regret was not taking the Wednesday off as well. Mainreachan Buttress is a cliff that keeps its cards close to its chest. It doesn’t reveal itself until you turn the final corner then in front of you appears a steep crag of blocky rock and turfy ledges, prime mixed climbing territory. The buttress holds some classic mixed routes following the obvious lines up the faces of the cliff. Mainline Connection VI 6 was in our sights, this steep line of corners and grooves was the whitest line on the cliff that day, it was warm; I was down to just a base layer for a lot of the approach. The climbing was fun, steep, and positive with the odd loose block to work around; these would definitely be frozen in-place in colder conditions. Thankfully the turf was solid, as it had been consistently cold for a few weeks now and the morning’s temperature rise hadn’t had any effect on the turfy ledges- essential to climbing the route. I climbed well, feeling confident on the steep positive mixed ground after climbing Shang-High VI 7 on Beinn Eighe a couple of weeks earlier. Simon climbed down from the belay and across to reach the smooth sea washed and deadly-greasy ledges which formed the first pitch, the traverse to the hanging belay at the base of the showpiece red wall. However today the wall was pink, conditions were good if a little chilly now the wall had lost the sun. Managing to avoid slipping and taking an unwelcome dip in the cold North Sea Simon reached the belay and commenced forming a web of gear to hang from. I followed the ropes down, across and round, slipping and sliding the whole way, not quite the warm up pitch I had in mind. Simon summed up the route nicely at this point as “a route of two contrasting pitches”, the showpiece main pitch which gives the route its name and grade still to come. The superb pink wall of an unknown-to-me mixed rock, where all the features are upside down, provides undercuts with slopey feet on the bold initial traverse before the relief of a crack is reached, a line to follow, not that the climbing eases. Sustained technical moves up the vertical wall provide a sublime problem solving expedition. Thankfully the crack yields plentiful gear, almost too much – I had to stop myself placing wires as I was going to run out of extenders before reaching the granite roofs that cap the wall. Reaching the good undercuts at back of these roofs, I looked down with a Cheshire cat smile, the trail of chalk marking my path up the face, the sea rolling against the base of the wall 35 meters below, it looked as amazing as it felt. Pulling through the roofs and into the finishing chimney was a sting in the tail which was a bit more of a thrutch than I was expecting, and quite a contrast to the rest of the pitch. I was truly elated topping out Cracks in Reality E5 6a, a truly outstanding climb, committing, and in a tremendous position, it definitely ranks up there with the best in the country. I am incredibly happy to climb it as it was just so much fun and completely absorbing climbing which just kept coming. I got totally hooked on The Red Hole at South Cove for a few months before the birds started nesting, it is an amazing and committing arena to climb and it’s only 5 minutes from Aberdeen! The Red Hole hosts a great number of three and four star classics, all guaranteeing exposure and adventure – it’s easy to see how I was hooked. One mingin' day I abbed in to have a look, 'nutting-in' as I went to keep myself close enough to the rock round the roofs at the top of the crag. I cleaned the corner crack, an old rotten peg, a wee loose block and some bits of dirt. I had a look at some holds but the rock was red, the red light, the signal that the cliff is unclimable. My thoughts then; it looks like there's enough holds, sparse for the feet but possibly just enough. Can I do it? How hard is it? I knew there must be some 6b climbing in there, which would feel hard coming straight out of the hardest moves of the Procrastination corner. The crack offered good small gear, but getting in a position to place it could be strenuous. Might it be E6? That feels scary, I'd probably fall off E6. I desperately wanted to re-climb the first pitch of Procrastination, incredible climbing in a committing position, it may be a 'short' pitch (probably just 15m) but it fairly packs it in- it's hard –proper 6b. Sadly the crack, the first crux, was literally dripping! I now appreciate the good conditions we had last time, how things can change in a week and a half! Alas it was not to be- what followed was a heck of a lot of trad-faff. Abseiling in, to swing across and set up a hanging belay above the sea and at the base of the Procrastination corner, sorting out the ropes, getting Darren clipped into the belay and myself off and finally it was time to climb! Procrastination climbs the big arching corner where the pink wall meets the granite overlaps, an obvious line. But is it? Procrastination -the old aid route- has a hard to interpret description but as far as I can decipher it follows the corner the whole way. 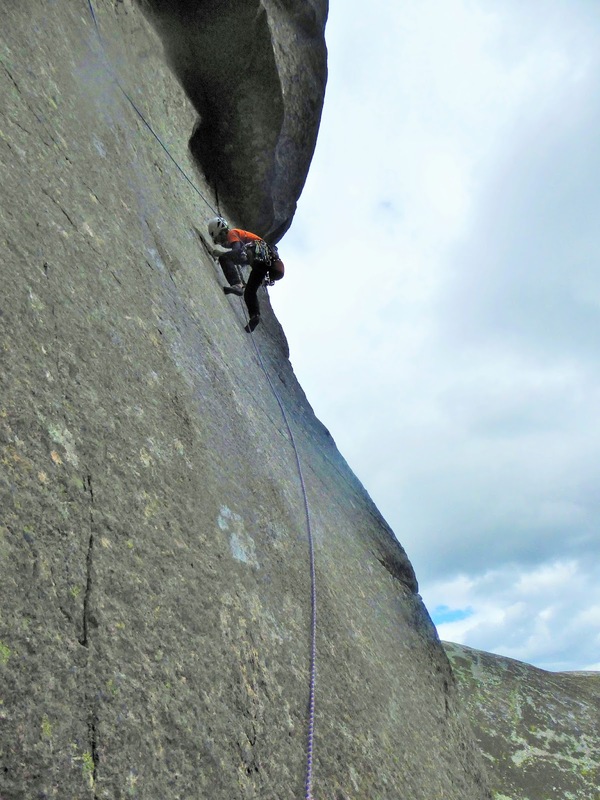 Procrastination – the modern classic free route- follows the corner until three-quarters of the way up then breaks right onto a granite slab for a breather before pulling spectacularly through the right hand side of a roof. But what about that top quarter of the corner line? The true old aid line, the steepest section of the corner unclimbed – or at least not climbed free. It called out to me. I moved away from Darren on the hanging belay, moving up the steepening corner, the climbing was superb and the crack in the corner offered up plentiful protection. I climbed past the exit right onto the slab that Procrastination follows and kept pulling up the ever steepening corner. 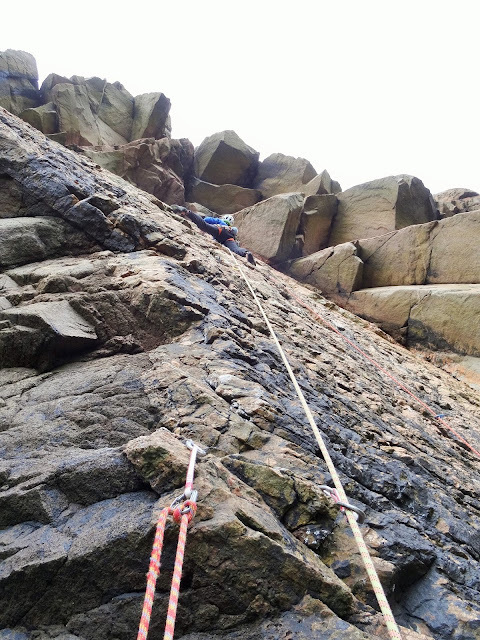 I managed to climb this new pitch first go, giving it E5 6b, and naming it Procyon – forming a link between the ‘Pros’ and the ‘Space’ naming convention on the wall. The moves were as good as I expected, the footholds were as small as I thought, it was technical but well protected and just damn good fun! I was really keen to re-climb the first pitch of Procrastination as it would give a perfect link into the big corner pitch of Procyon to give two tremendous, top-end, E5 6b pitches taking you from the base of the crag all the way to the top – next time, when I come back to try Lost in Space E6 6b. The Red Hole just keeps giving, and I’ve got more to give back too. On a bit of a high I decided to ride the wave of psyche and managed to comfortably flash the tricky Teetering on the Brink of Madness E5 6b, a route with a name like that and a reputation to match had to be good, and it was! A great end to another great day on the Aberdeen sea cliffs. ‘Climb the niched crack-line to a ledge.’ It was obvious, definitely the most obvious line up the steep front face of Lochan Dubh Crag. I don’t know if it does – but I had created, in my head, quite a reputation for the route. Major Domo E6 6b – sustained, not bold, endurance is key, I was feeling fit, and more importantly psyched. My head was in the right place, willing to ‘give it a go’, confident to give it a good go. Move-by-move it is exquisite, the positions forced by the rock, the edges, pods, slopers and the crack, the raison d’etre, but it also provided ample protection. I enjoyed every moment, every movement, it was perfect, and conditions were great. It all went smoothly, I read the crux sequence and executed it first go, strenuous but I committed to it - no climbing up and down here. A foot slip with one hand on the finishing ledge brought a rush of adrenaline and a shout of “NO…” I held on, replaced my foot and pulled over, another shout, this time of euphoria, elation, I was psyched. My first E6 onsight, a goal that I had set myself for the year, it was the first day of May, what would the rest of the year bring? 'Like a delicate dance' were the words I shared as I drifted rightwards across the granite slab, pressing toes precisely on the granite edges, trusting the friction. The contrast in moves from the burly sequence departing the belay and moving up to the first gear was refreshing, these moves were much more easily enjoyed, time could be taken to feel the texture of the cairngorm granite, time could be taken to unlock the sequence and move efficiently. The sanctuary of a good hold on the arête and an old peg allowed for the world of granite overlaps that had just come into view above me to be absorbed and assessed. A maze of grooves, slabs and overlaps typifies the strata of the Central Gully Wall of the mighty Creagan Dubh Loch. I moved right along the final moves of the crux pitch of The Naked Ape E5 6b to a very ‘Dubh Loch’ style move onto the belay ledge where the traverse meets the counter diagonal of a large groove which points the direction for the start of the 3rd pitch. Like every morning we approached with open minds, open to the options ahead, we would climb anything that’s dry they’re all good. This morning however there was an extra spring in our steps, the crag was in view, glowing in the morning sun dominating the vista above the calm Dubh Loch, not looking so Dubh this morning. We filled our water bottles, and took an extra drink from the stream flowing from the loch this morning, we were going to need it. It was probably 25 degrees and humid, the trousers were rolled up with zip vents open, my t-shirt was saturated. I was making good use of my ‘Verdon hat’ a very uncool baseball cap with a neck shade, a very practical hat for a Scottish person mid-summer in the South of France, or in this case Costa Del Dubh Loch. I didn’t anticipate it being much use after our Europe trip last summer, I was happily being proven wrong. We arrived at the base of Central Gully, the choice was obvious; the mega-classic Voyage of the Beagle E5 6a had to be climbed. This tremendous voyage links obvious left trending grooves and slabs to join the common top pitch of The Naked Ape. An unforgettable journey through some incredible rock architecture of the grandest scale available in Britain. I am reading to become more articulate, writing to become more eloquent, and striving to be more epigrammatic. Writing succinctly, providing just enough detail to draw the reader in, but not bore them, allowing them to be absorbed in the scenario, and capturing their imagination so they carry on reading -a good story teller is blessed with these traits. These are the skills I wish to learn, to develop, and to share with others. The pile of books I have yet to read is motivating, I am eager to hear of stories, of epics, of adventures, I am keen to learn and to be absorbed in the tales. I am almost finished reading the book I’ve been on since February, (about time too!) which means the difficult choice of what to read next is soon to be tackled… I’ll let you know what I choose. 'A long way to walk for not much climbing.' We had just been rained off Cir Mhor, a tremendous pyramidal peak of fine granite situated proudly at the end of Glen Rosa. I had climbed one pitch, one very good pitch, but still only one pitch before the clouds came in, the wind picked up and the rock was slippery wet. I abseiled off. We hid under a boulder and ate our sandwiches, a long way to walk for a rainy picnic. I remembered a picture I had seen of a boulder problem below the crag, we stopped off on the descent, the climb proved tricky. A slopey lip traverse with smeary feet and a committing move to a thankfully good jug for the highball topout. A great problem in a stunning location. Dayni waited patiently entertaining herself by capturing the moment on camera, and making friends with a happy caterpillar. We knew the weather was due to close-in this afternoon so had made an early start, enjoying the walk along the glen that morning in the sun with just shorts and t-shirt on, and of course making use of my Verdon Hat. Now it was a very different place with the rain showers gaining in frequency and duration, the goretex jackets and waterproof skin were well tested on the return to the carpark some 7km away. Worth every step of the long walk to be in the mountains and enjoy those moments in good company. The red and yellow hot air balloon flickered in and out of focus, floating just above the horizon at the end of the long straight tarmacked road through the red desert. Flickering, blurring then coming back into focus again, as if the heat of the sun was causing the air to haze. The balloon moved, quickly with a jolt, now in line with my left eye and continued with its routine of blurring, and flickering around before coming back into focus. I’d seem this image before, many times over the years, it was two years since last time the appointment letter stated, although I remember it from my childhood. Always the same red and yellow hot air balloon, always at the end of the desert road with the double yellow lines. The image always moving and blurring, then coming into focus. It was like a subliminal message, an image my subconscious would remember forever, I’ve seen this image periodically for most of my life. One day I would wake up staring down the long straight desert road. I’d feel the heat of the sun high in the sky radiating from the black tarmac. I’d rub my eyes and sit up wondering where I could be, glancing around, looking down the road and see the red and yellow hot air balloon blurred by the heat from the sun, flicking back and forth, out-and-in to focus. One day I’ll spend some time on the desert road, the road to the unknown, the road of discovery, and of course adventure. But for now the red and yellow hot air balloon flicks out of focus, then disappears forever, or at least until next time I'm staring down the keratometer. Thanks to all those who have contributed or taken photos, Simon, Darren, Uisdean, Paul and Dayni. And of course thanks to all those I have had the pleasure of enjoying these adventures with, until the next one, cheers!